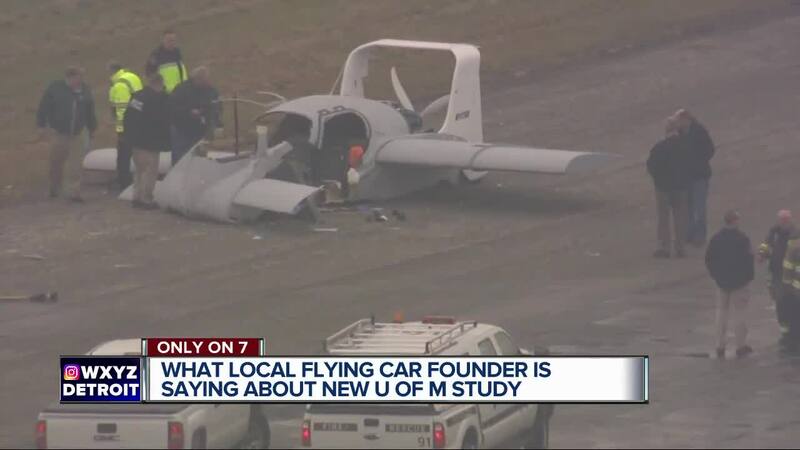 The founder of a flying car company says he can't wait to get back to work in the wake of a crash at Willow Run Airport after a University of Michigan study said in some cases flying cars can be better for the environment. YPSILANTI, Mich. — One entrepreneur thinks flying cars will one day change the way Americans travel — even though his creation almost cost him his life. Sanjay Dhall, the founder of Detroit Flying Car Company, is still recovering from a December crash at Willow Run Airport in Ypsilanti. Dhall said he was testing out the controls in his flying car prototype when he accidentally took off and found himself 150 feet in the air. “One wrong calculation can mean the difference between life and death,” Dhall said. He says he now is more committed than ever to getting the technology right. “I still want to get back and build another prototype, a demonstrator vehicle that will succeed,” Dhall said. A study released this week by the University of Michigan motivates him. It found that for trips of about 60 miles and longer, a fully-loaded flying car carrying a pilot and three passengers had 52% lower greenhouse gas emissions and time savings compared to ground-based gasoline powered cars with an average vehicle occupancy of 1.54. "Consumers could be incentivized to share trips, given the significant time savings from flying versus driving," The study's author, Akshat Kasliwal, said. The study found flying cars would travel the 60 miles much faster, resulting in a time savings of about 80 percent compared to cars driving on the road. When compared to electric cars, fully-loaded flying cars still had 6% lower greenhouse gas emissions on trips longer than 60 miles. “When flight happens, constraints are gone. And when constraints go away things have a way of going cleaner ways,” Dhall said. The study did find that on short trips, it is more efficient to stay on the ground. Dhall points out that his prototype features wings that retract into the vehicle, allowing travel by road or sky. In theory, he says it could be an overall greener way of traveling. He says he named his company in honor of the Detroit inventors who changed the way people around the world travel. He believes flying cars will do the same in the future.